Amid the Gothic splendour of the reading room in the John Rylands Library, poets Chris McCully and Michael Schmidt gave free readings of work spanning the range of their careers and mapping out their lives as, to quote Schmidt, “rootless cosmopolitans”. Michael Schmidt, a witty and quietly eccentric man and founder of the poetry publishers Carcanet Press, gave an excellent reading which chronologically traced his poetry from boyhood. 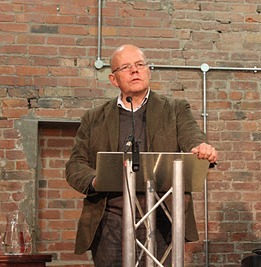 Schmidt is a central figure in contemporary poetry and usually appears at readings in his capacity as director of Carcanet, so it was a delight to see him behind a podium as a poet. He delivered his work gently, in a way that allowed the poems to stand alone, free of any kind of insistent inflection. A poem about showing Robert Burns around his school in Pennsylvania and one about a young boy catching a Scoprion were notable for their touching clarity and complexity disguised as simplicity. This was a theme that continued through his reading, with even poetry concerned with celestial and theological discussions shot through with fragmented images such as a monk talking to his cat. Chris McCully, who towered over the podium in a three-piece suit and thick-rimmed glasses, delivered his poetry with more of a leaning to theatrics. These ranged from the wonderful, with a poem about assembling through a process of fragmentation his relationship with his house, to the inanely nostalgic (“once there was gravy, now there is jus…”). The familiarity of the two men with one another allowed for a candid and absorbing discussion, and Schmidt’s dry and slightly cutting – dare I say flirtatious? – comments to McCully went some way to breaking down the stilted formality which often prevents live literary events from becoming the kind of free-flowing and open discussions they ought to be. Indeed, Schmidt’s answer to the ‘why poetry’ question that poetry is valuable and necessary because it is interactive both called to mind and refuted the great shame that literary events and indeed poetry are seen by so many as stuffy and out of reach. Catch him at his next reading if you can.